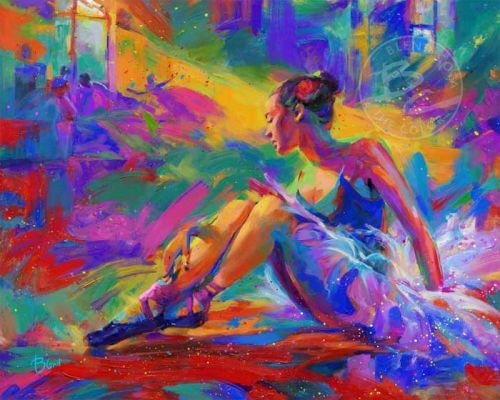 Blend Cota limited edition giclée on canvas:"Ballerina, The"
About the Art:This prima ballerina is deep in thought about her impending performance. Blessed with ability to express her emotions through the movement of dance, she visualizes her routine as an abundance of bold colors, each more dramatic as the other. I painted her in a feminine palette which showcases her beauty. -B.C. Blend has painted it all, an astonishing range of styles from simple study sketches to landscapes and nudes, to detailed realism and abstract installation. His love of art has taken him to many paths and fulfilled his artistic persona with a vast range of trades and experience. He always liked Picasso, his legacy of fearless creations, borderless shapes and bold blocks of colors.